Walking in a bit of old forest above Sandy Lake on the summer solstice (2017), I encountered a pair of yellow birch and hemlock that seemed to be growing from the same base, their trunks ascending to the skies in tandem. I thought of it right then as an “Acadian Forest Love Affair”. Subsequently, with my eyes open to this forest affair, I viewed a half dozen or more other such couples. Three are shown in the photo above. (Click on the panel for a larger version.) All three occur on mounds formed from the upturned base of a large, old tree blown down by strong winds likely 100+ years ago, forming a pit and mound structure. The couple at right are on a mound that has largely eroded away, perhaps with some collapse/compaction as well, exposing the tops of the roots and showing them closely intertwined; an embrace. The roots remain covered on the mound in the photo at left, while they are partially exposed in the middle photo; it’s a good bet that if you washed away the mounds in those cases, the trees would be found in the same embrace as the hemlock and yellow birch in the photo at right. I am not so sure about the identification of the birch in the photo at right; it looks more like paper (white) birch; I will have to go back and check out the buds or leaves, or the taste of the bark. There are natural hybrids between the two and I have found trees at Sandy Lake and Environs that appear to be hybrids. 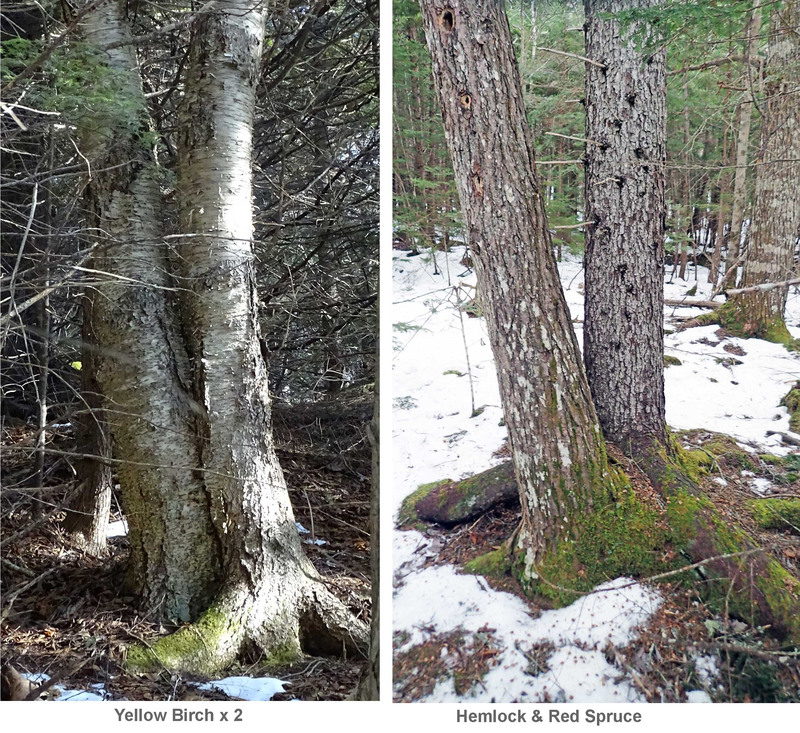 The association between yellow birch and hemlock seemed too intimate to be purely a coincidence of seedlings of the two species growing close together. When I finally got around to checking out the literature, I wasn’t surprised that a close association of hemlock and yellow birch is well known. 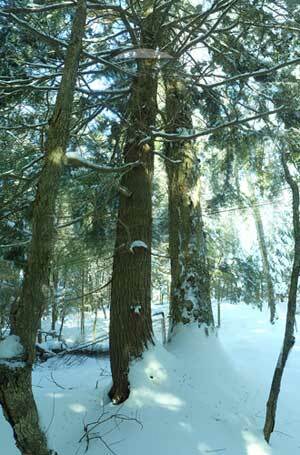 Of all tree species, hemlock and yellow birch show the highest degree of association in all habitat type groups where they occur. This phenomenon is often mentioned, but not documented in the literature. In NSDNR’s Nova Scotia Vegetation Types, MW3 is described as an association of Hemlock – Yellow birch / Evergreen wood fern, a “late successional mixedwood Vegetation Type (VT) [which] has an overstory co-dominated by hemlock and yellow birch.” The description for that association applies pretty well to Hemlock/Yellow Birch associations in the vicinity of Sandy Lake. However, I found only one description in the literature of physical intimacy of the sort I had been observing, that in a paper titled Survival of tree seedlings on different species of decaying wood maintains tree distribution in Michigan hemlock–hardwood forests, by Laura Marx* and Michael B. Walters, Journal of Ecology (2008) 96: 505–513. At the individual tree scale, seedlings of Tsuga [hemlock] and Betula [birch, referring to yellow birch] often become established on the same wood piece and can ultimately become pairs of canopy trees as evidenced by pairs of stilt-rooted Tsuga and Betula trees with tangled roots. The photograph accompanying that bit of text in the paper by Marx and Walters shows a juxtaposition of roots very similar to that in the photo above. Their paper also offers an explanation for the phenomenon, which relates to the “wood piece”. 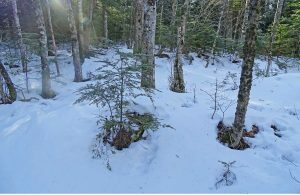 It had been well known that regeneration of the small seeded yellow birch is weak where there is a lot of leaf litter as there can be on the forest floor, nor do seedlings do well where there is a lot of competition from rapidly growing ground vegetation, e.g. after a clearcut. Also, while yellow birch is a long-lived species found in old forests and is often found in assocation with hemlock, unlike most other long-lived species, its seedlings are not very shade tolerant. So typically yellow birch establishes on the base of tip-ups (blowdowns, tree-falls) or other large pieces of decaying wood which shed leaf litter and where the gap formed from the blowdown allows more light to penetrate than under the closed canopy. Under these conditions, yellow birch can be very fast-growing, thereby getting ahead of other species and reserving its space in the new canopy as the gap closes. 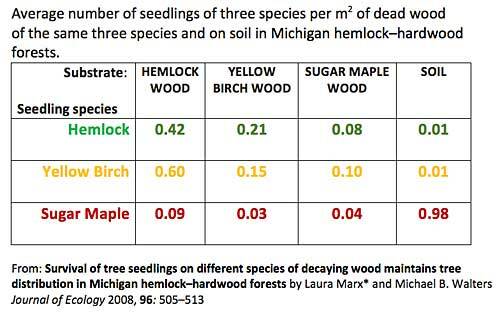 The data show that hemlock and yellow birch seedlings were much more numerous on hemlock wood than on other woods or on soil, while sugar maple seedlings were commonly observed on soil, and rarely on wood of any of the three species. Yellow birch even seemed to ‘prefer’ hemlock wood over its own wood. They also found that seedling survival beyond one year and longevity of hemlock and yellow birch seedlings were highest on hemlock wood. 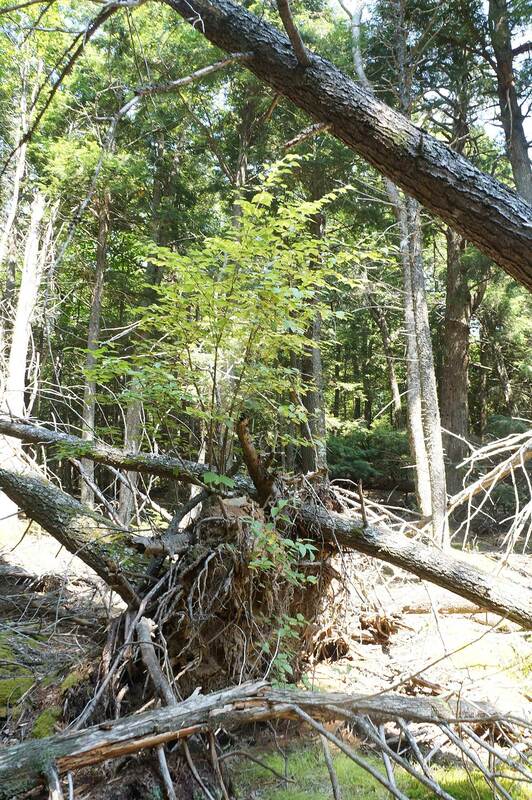 So this clear preference of both yellow birch and hemlock seedlings for hemlock wood seems to explain why they are frequently found close together. Of course we could then ask, why should yellow birch prefer hemlock over other wood types, which is an evolutionary question. Suffice it to say for now, these two species have chosen to live together, often intimately! Once I assimilated those results somewhere in my gray matter, I realized I had been overlooking or not paying much attention to other “couples” in the forest and went back through my photos, and even back to the forests by Sandy Lake to look at them. 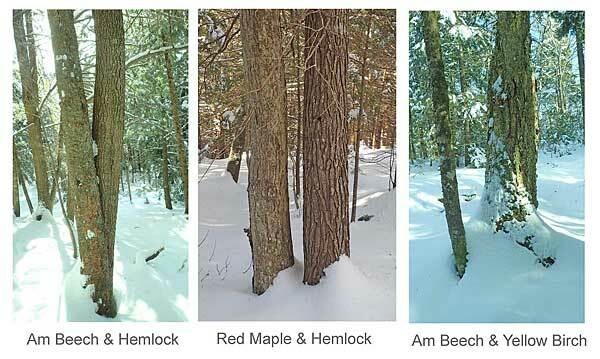 First, there is hemlock and hemlock, which based on the figures in the table above, one would expect to be nearly as common as the hemlock-yellow birch couples. I didn’t have trouble finding them in winter (above). The cluster at top right are all on one mound. There are also lots of mounds with hemlock and other saplings on them. 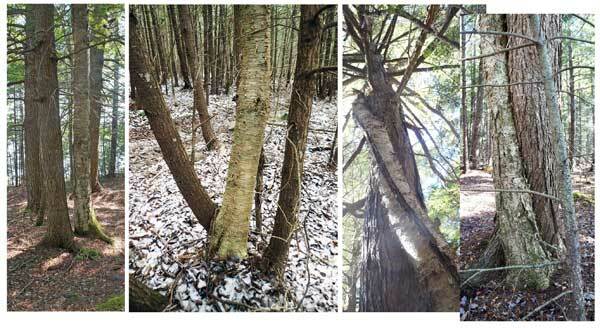 The American beech, in two of those photos, is common in these woods, both as old snags, and younger trees and even some bigger ones that are still living. It was obviously an important species before beech bark disease came along (it entered North America via Halifax), and a reminder of how forests change over time. There’s a lot more to the research by Marx and Walters. For example their results help to explain how discrete patches of hemlock and yellow birch in one place in Michigan and of hemlock and sugar maple in another persist without change in the hardwood component for very long periods of time. 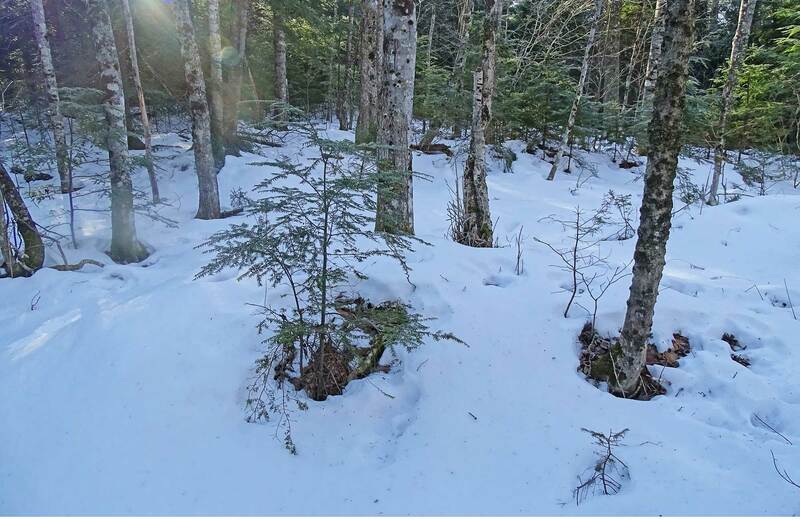 In these old, mixed Acadian forests by Sandy Lake, we can still see the natural processes that maintained yellow birch in the pre-forestry era at work. 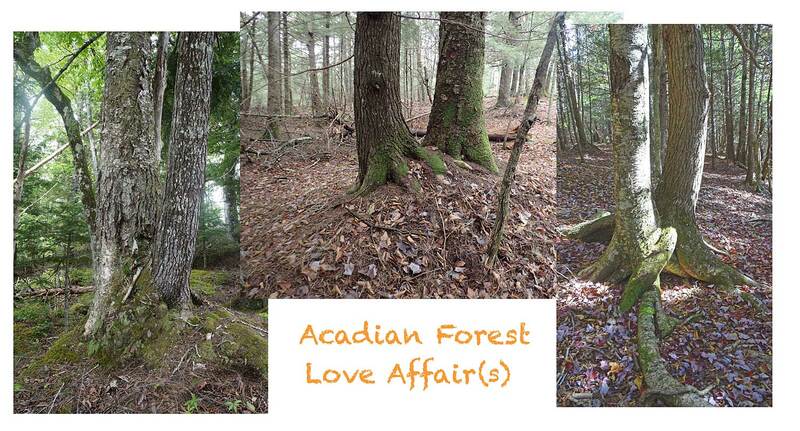 And in these forests we can still marvel at the “Acadian Forest Love Affair(s)”. While some of the secrets surrounding the affair between yellow birch and hemlock have been exposed, there’s probably lots more to the story yet to come. For example they are both strongly mycorrizal (meaning they make use of fungi on their roots to obtain nutrients and even to exchange nutrients with other plants) and could be sharing more than just the space as they grow up together, for their mutual benefit. A marriage made in the Acadian forest, we could say. *Birch and conifer deadwood favour early establishment and shade tolerance in yellow birch juveniles growing in sugar maple dominated stands. Jean-Bastien Lambert et al., 2016. Canadian Journal of Forest Research 46: 114–121. 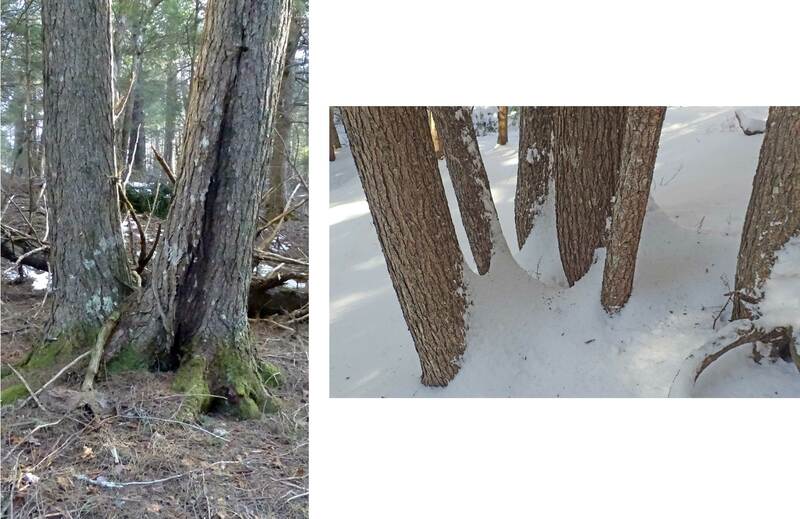 **Regeneration responses to gap size and coarse woody debris within natural disturbance-based silvicultural systems in northeastern Minnesota, USA. N.W. Bolton, A.W. 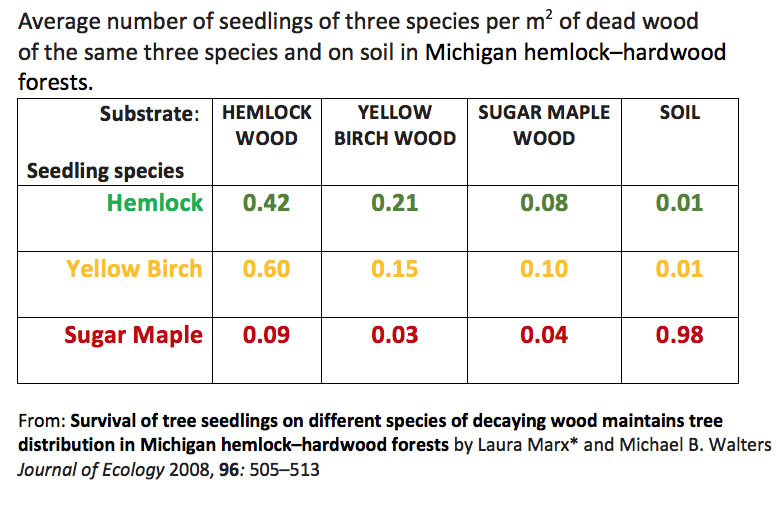 D’Amato (2011) Forest Ecology and Management 262: 1215–1222. 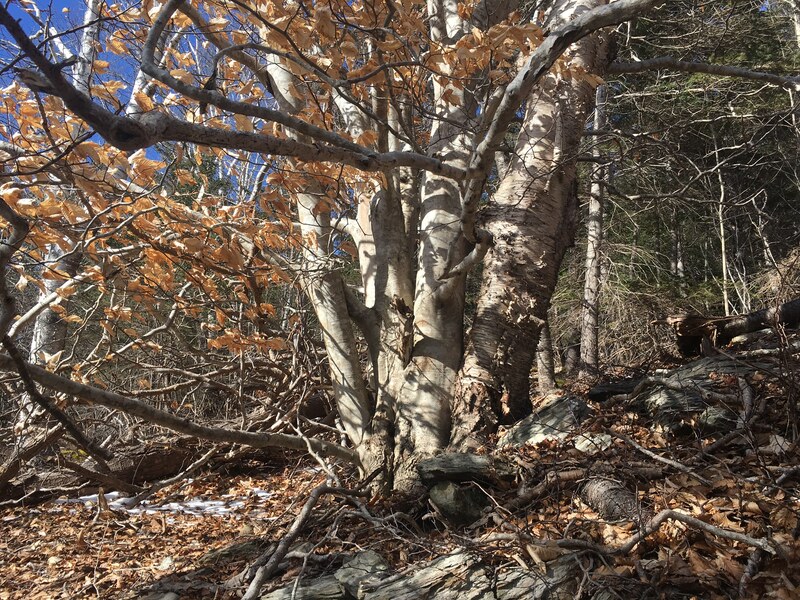 “Saw this beech and birch sisterhood near Bear River today…Thought u might enjoy.